For those who don't know, Sivak Games has released a brand new NES platformer via RetroZone which has completely sold out its initial launch quantity almost immediately after being listed for sale. Rest assured, RetroZone has stated that more carts are being produced and will be available for sale on the site shortly. Not too shabby for a $30 homebrew NES title being released almost two decades after the NES era ended. 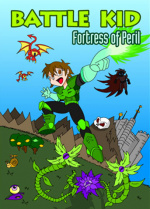 As the game's storyline goes, upon hearing word of a SuperMech being built, your hero has been sent into action and must take on the ancient high-tech fortress in order to keep this weapon of mass destruction from being built. In a game that is more than a little reminiscent of the classic 8-bit Mega Man titles, Battle Kid has a nice control feel to it and very challenging level designs. And with over 550 rooms, 30 different enemies, and 8 monstrous bosses to tackle, you'll never be at a loss for things to do, that's for sure. We've got a cart of our own on its way and we'll have a full review of the game shortly after it arrives to us. While $30 is a bit steep for a homebrew NES title, it's still always a good idea to support those who are working hard to keep retro gaming alive and well. lol, funnt to see if they get the idea to do this with Megaman 9 & 10, It not hard to find new mechains that NES and SNES games so it could make a lot of money. They put that much work into making a new nes game and they couldn't find someone who could draw a decent image for the box/cart? the art looks like a suburban, midwestern teenager followed one of those "how to draw anime" step by step books and finished it with the free "paint" program that come with windows. How embarrassing. The game looks cool enough, though. Ummm..... maybe a DSiWare Release and I will buy! @5. That's pretty much the idea I think. Dang, this is some funny stuff. While I do have an NES, I'm not very trustworthy of the site RetroZone. Hopefully the game will find mainstream interest and be released on some digital distribution services. Kid_A, it's an unlicensed game, so there is 0% chance of it ever appearing on the VC. Why didn't this company just get a Wii development kit and make it a WiiWare game? They would have made more money (and be a legit developer). When I read about the game, I arrived to the same conclusion as TJ Spyke-san. Of course, Ren-san has a point. @12. Because it isn't a company. It's just one guy from what I understood. Looks more like IWBTG than Megaman. @12 The smiley indicates a joke. I'm sure Kid A knows that. Also, about putting it on WiiWare, some people prefer the physical media. Gives you more of that retro feeling if you can play it on the original hardware. No one would pay $30 for this on WiiWare, but the novelty of it on the NES format makes it worthwhile to retro game enthusiasts and collectors. but a bit expensive for just a homebrew game. If I has a NES, this would be awesome! IF not virtual consel than wiiware maybe? It doesn't look like they need any help marketing it. LOL. $30 is fairly standard for a homebrew title for US consoles now... time for programming, manufacture and anything else needed. I don't see a lot of people complaining about paying that for 2600/7800 titles for example. Met the programmer and tested this out at Magfest 8 in January The controls are wonderful, not to mention everything else great about the game, although I only played up to the first boss. Ordered my copy on Monday _ can't wait to get it. I also ordered me a copy of Mystic Pillars which is on sale for $22. If he had them for sale at Magfest I would already own them, lol... But, yeah, Mystic Pillars is a Columns like game and was the second game Sivak programmed. I'm really impressed with his programming skills I hope he keeps at it. . If they had a digital download version, I'd be all over it. My NES is 4000miles away. Bought the stuff needed to make a NES to USB port so I could play emulators with my NES Advantage. They may have premade adapters now. And there's a lot of awesome never-released stuff out there from really talented individuals: (they're NES rom hacks, but not just sprite changes) Mario Adventure (a totally new Mario game based on the SMB3 engine, but with many differences in the core mechanics) and Zelda Challenge: Outlands (a Zelda 3 of sorts, using the LoZ engine, but an entire overhaul) Both are real hard but beatable and carefully made, and so worth a look! 30$ is rather a very cheap price to go back in time for. id be all over this game, wish it would sell over here, id sure give myself a copy. seems better than anything there is on DSiWare...except for popisland. Yes, but how many copies were there in the first place? Do I see a Nintendo Quality Seal on the photo? Have Nintendo approved this. Pretty cool that people are still making NES games. I'd like to get it. When its in stock again where can I buy it? I think it's very cool that I have a NEW NES game on it's way. Cool. It's amazing that people are still making NES games. They say that it is an entirely new game, no code was borrowed from Mega Man, not sure I believe that... even some sound effects are identical, like when the blocks are appearing and disappearing. Is there still going to be a review? And what other new nes games are out there? but yeah the game is back out! 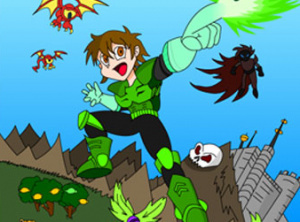 Battle Kid 2: Mountain of Torment sequel coming real soon, maybe around march from what i read.